San Basilio (spelled S. Basilio on station signs) is just across a low wooden footbridge from the San Basilio Cruise Terminal, which is used by small- to medium-size ships. The station is at the foot of the Zattere, a waterfront promenade that runs along the northern side of the Giudecca Canal. 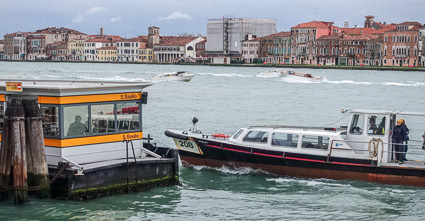 The island of Giudecca and the Hilton Molino Stucky Venice hotel are directly across the water. A large Conad supermarket is close to the station entrance (behind the yellow façade on the satellite image), and a five-minute walk will take you to one of Venice's most lively squares, the Campo Santa Margherita. For descriptions of hotels within walking distance of San Basilio, please click here. Note: San Basilio does not have a ticket booth or vending machine, so here's what to do if you need to board a water bus without a valid ACTV ticket or Tourist Travel Card.